The earliest Jordan River dam was constructed in 1859 by Ferimotz Little and others to irrigate land to the west of the river. In 1885 a "Compromise Agreement" was negotiated to determine the elevation of the lake and was revised in 1986 by the district court. 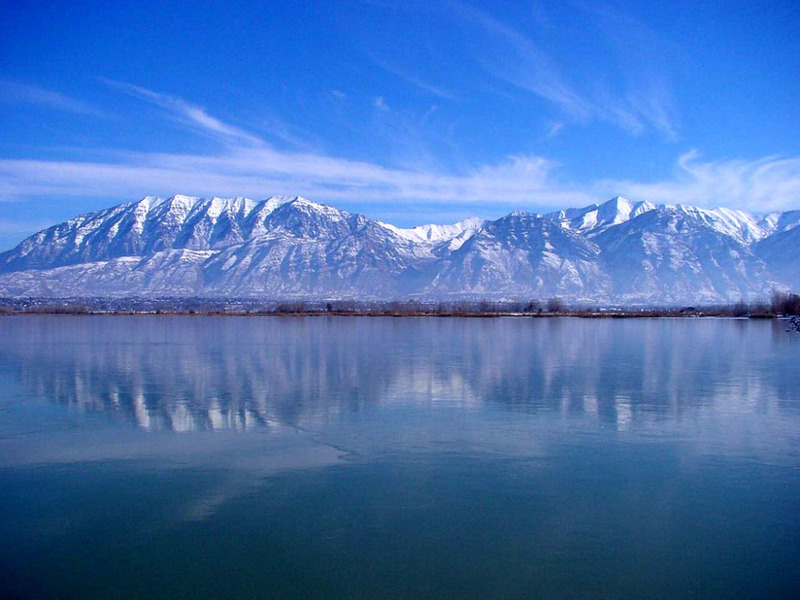 At this time a "Utah Lake Jordan River Flood Management Plan" was adopted. lake complained about the dam, claiming that it was flooding their property. Their complaints were investigated by the county court of Salt Lake, with the finding that the dam had no effect on the elevation of Utah Lake. In 1880, the dam was raised, causing more outcry from the Utah County landowners. In 1885, after several years of dispute, an arbitration committee of prominent citizens established a compromise elevation of 4,515.799. The "Compromise Agreement" also provided for the operation of the gates in the Jordan River. 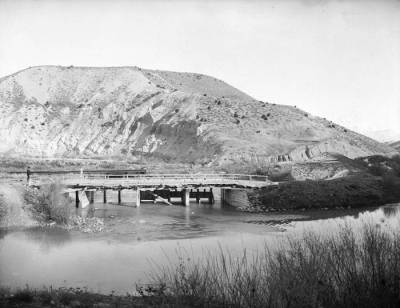 The Utah Lake and Jordan River Commission then took over the burden of operations and deciding how the gates would be operated and to what extent they would be opened and closed. This compromise elevation was changed a century later in 1980 when heavy precipitation caused flooding of lands adjacent to the lake. In 1984 $1.5M was appropriated to the Disaster Relief board, $500,000 of which was used for engineering studies to alleviate the flooding problems. These studies produced the "Utah Lake Jordan River Flood Management Program" with engineering and construction costs of $10M+. The construction program consisted of a new outlet structure at Utah Lake, dredging in the lake and the Jordan River and modification to five water control diversion structures. The operation of the lake sought to reduce the lake to compromise level by the end of runoff season, utilization of National Weather Service forecasts for Utah Lake inflow to determine flood releases and to continue the Utah Lake-Jordan River Dam Commission. It was stipulated on March 8, 1985 that the flood waters in Utah Lake and in the Jordan River shall be managed solely pursuant to the "Utah Lake and Jordan River Operating Procedures and Flood Management Plan," rather than the 1885 Compromise Agreement; and that the flow in the Jordan River would not exceed 3,400 cubic feet per second measured at 2100 South. The new compromise elevation of 4489.0455 above sea level (USGS Survey datum) was established in 1985. When the lake is at compromise the storage capacity is 870,000 acre-feet, of which 128,300 acre-feet is inactive storage, occurring at about 9.2 feet below compromise. The plant, located east of Saratoga at the outlet of Utah Lake, is owned by the Associated Canal Companies, consisting of the Utah and Salt Lake Canal Company, the East Jordan Irrigation Company, the South Jordan Irrigation Company, Salt Lake City and the North Jordan Irrigation Company. In the beginning, each company owned an undivided one-fifth interest in pump Numbers 1,2,3 and 4; the first four named above owned an undivided one­-fourth interest each in pump Numbers 5, 6 and 7, and Salt Lake City owned the 130 horse power gasoline engine installed to meet the City's exchange obligations in the event of a power failure. Utah Lake Pumping plant. Owned by the Associated Canals, in 1907 this was the largest pumping plant in the United states, capable of pumping 700 cf/s. horsepower, and one fire pump having a capacity of 400 gallons per minute. The entire plant was capable of delivering for distribution 700 cubic feet per second, or 452 million gallons of water every 24 hours. According to Brad Gardner, Utah Lake and Jordan River Commissioner, all of the horizontal pumps were replaced in about 1912. In 1947, pump No. 5 was replaced with a 230 cubic foot per second vertical pump. A new seventh 100 cubic foot per second pump was installed as part of 1953 Utah Lake Irrigation Company agreement. On January 14, 1901, litigation began in the District Court of the Third Judicial District, in an action, Salt Lake City, et al. v. Salt Lake City Water & Electrical Power Company, resulting in the Morse Decree, dated July 15, 1901. Intake view of Utah Lake Pumping Plant in 1989.
limitations hereinafter set forth, the right to the use of all the balance of the waters of the Jordan River, for municipal, irrigation, culinary, and domestic purposes, to the extent of the capacity of their several canals, and the right to impound and store all of the waters of said river in Utah Lake, and to have their title thereto quieted." "Subject to these limitations and conditions contained in the agreement of compromise entered into in 1885, between Joseph W. Cooledge and others and said city and canal and irrigation companies, the said city and canal and irrigation companies, shall have the right at all times to shut off, impound, and store the entire flow of the Jordan River, and hold and save the same for further use to the extent which, in their judgment, their interests may require; and as between themselves, the said city, the Utah and Salt Lake Canal Company, the East Jordan Irrigation Company, the South Jordan Canal Company, and the North Jordan Irrigation Company, shall have an equal right to the use of all such water, to the extent of the capacity of their several canals, and while there is sufficient water for that purpose, may each take the full quantity of water their respective canals will carry, and when the water is insufficient to fill all the canals to their maximum capacity, then the city and canal and irrigation companies shall be entitled to an equal division thereof; provided, that if by such division one-fifth of the water should exceed the capacity of any of the canals, such excess may be used by such remaining canals as have the capacity to take the same, in equal proportions •.•. " "Beneficial use shall be the limit of rights."